This is the doom metal sleeper hit of the year. Monolithic and powerful, immaculate in its conception, full of potent riffs and delicate melodies and counterbalanced with all sorts of exciting ideas, this is the sort of metal mastery that few of the bands peers can truly match up too. These road dogs have spent years crafting this music and there is an undeniable and very powerful poetry to the work here. A huge step forward, and a much doomier take on a band who used to really push the rock and roll, Hopeless is a powerful journey to the dark side of the human psyche. 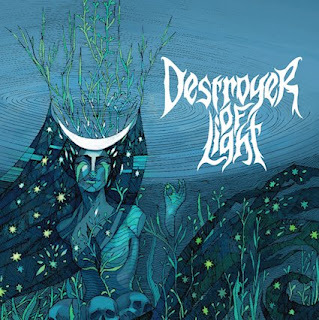 Stoner and doom metal is an incredibly oversaturated genre these days and that's because so many bands don't put the care and attention to detail into the music that Destroyer of Light do. This EP is a mere two tracks but both are fairly long, the run time clocks in just under 18 minutes. It's a record that requires a measure of patience, but to me that's a huge part of the appeal. The vocals in particular are a huge step forward here, pretty much entirely clean and more articulate than ever before they are a fitting counterpoint to the enhanced melodic lines and potent forward steps that they represent in and of themselves. The grooves here are pummeling and only accentuate the power of the Sabbathian stomp. There have been so many thrilling developments in this band it's impossible to sort them all out in a few hundred words. Suffice to say, Destroyer Of Light have carved out a reputation for themselves as not just one of the most exciting bands going right now but a band who seem to have the ability to keep growing, progressing and hinting at weird and exciting realities that we will never forget. So take a deep breath and dive on in!